Mazda fans, if you are eager to see one of the most iconic and eagerly anticipated sports cars of recent years, you’re in luck. 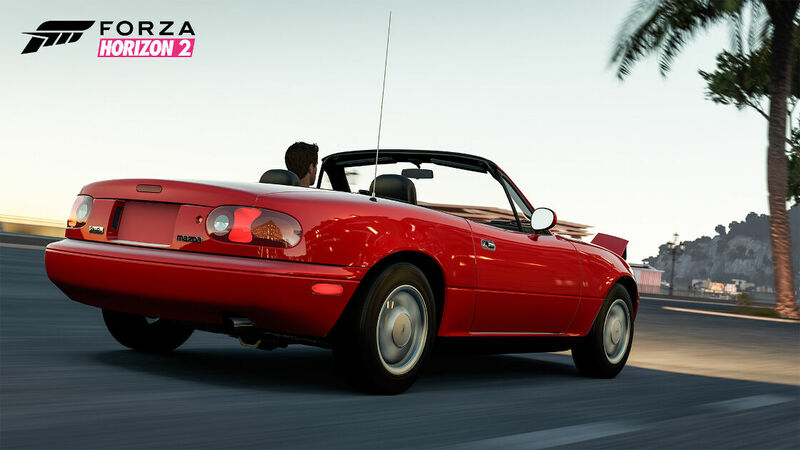 Next week, the 2016 Mazda MX-5 Miata will make its digital debut First in Forza as part of the upcoming Mazda MX-5 Car Pack! 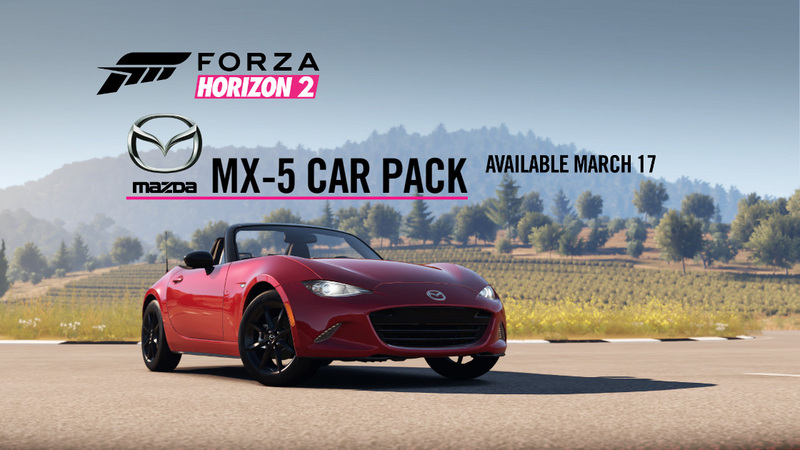 The brand new car pack features four iconic Mazda MX-5 models and will be available to download for free on Forza Horizon 2 for Xbox One on March 17. The Mazda MX-5 Car Pack features four amazing examples of the MX-5’s legacy of sporty style and thrilling driving. Starting with the car that reignited the world’s love of sports cars in the late 1980s – the 1990 Mazda MX-5 Miata – and featuring three other models, including the 2005 Mazda Mazdaspeed MX-5, the 2010 Mazda MX-5 Super20 concept car, and the upcoming 2016 Mazda MX-5, this pack covers more than 20 years of the MX-5’s legendary contributions to sports car history. 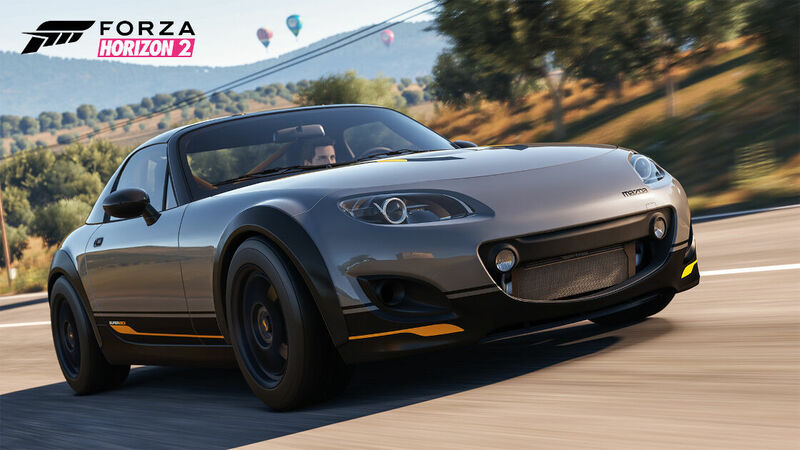 In addition to the launch of the free Mazda MX-5 Car Pack, we’ll be kicking off an exciting Rivals contest for Forza Horizon 2 players on Xbox One. 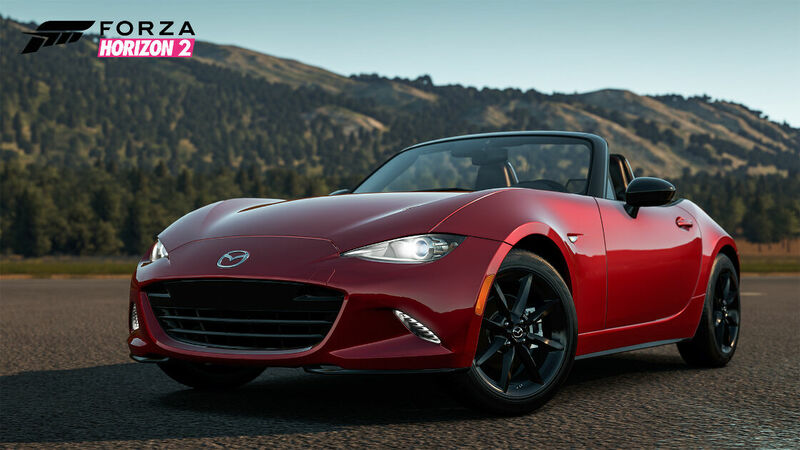 The Rivals contest, which begins on Tuesday, March 17 and ends on Thursday, April 30, will give Forza Horizon 2 players the opportunity to win a real-life 2016 Mazda MX-5. Once registered, players can set a time in the “Mazda MX-5 Challenge” Rivals event in Forza Horizon 2 for Xbox One and while anyone can set a time in this Rivals event, only registered players’ times will be eligible for prizes. For full rules and conditions for this contest, please see http://rules.xboxpromotions.com/mazdatimetrials and below for more details. The Mazda MX-5 Car Pack will be making its worldwide debut this month at the Mazda booth (#513) at the SXSW Gaming Expo in Austin, TX. 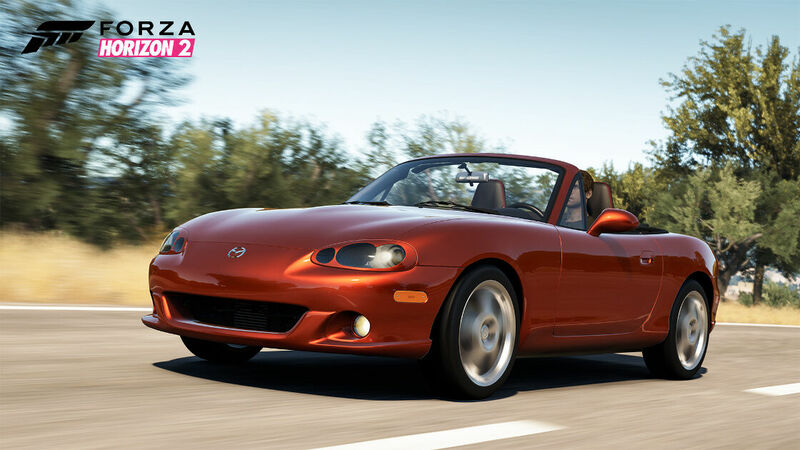 In addition to letting fans get their hands on the Mazda cars in Forza Horizon 2 for the first time via two interactive driving simulators pre-loaded with the Mazda MX-5 Car Pack, Mazda will also announce the winners of its recent Mazda Design Challenge contest on both Xbox One and Xbox 360. Stay tuned to ForzaMotorsport.net and the Forza Hub app on Xbox One, as well as our Twitter and Facebook pages for more information on the Mazda MX-5 Car Pack. After 25 years in production, the Miata is still doing things right. So right, in fact, that the driving experience of the latest Miata is nearly identical to the original, and that is a good thing. Sure there is more power – 155 horses vs. 116 in the original Miata – and the new model is a bit heavier, but the intuitive steering, danceable rear end, and impeccable transmission are all still there. It’s no wonder the Mazda Miata is one of the most popular and affordable paths to racing; it’s built for the role. The 2016 Miata combines the best of the modern with what’s made the MX-5 such a reliable favorite for more than two decades - a credit its identity as an instant classic from day one. When first introduced, the Miata brought back the memories of the roadsters of the past, particularly the Lotus Elan; small and nimble and full of fun, but now with Mazda reliability thrown in the mix. You could drive this little roadster to work and back all week then spend all weekend working out the kinks of the curviest roads you could find. Sure the Miata was cute, but any driving enthusiast who got behind the seat immediately became a fan. It didn’t take a ton of horsepower to provide excitement, it’s the whole package that make it a nimble joy to drive. These desirable traits are courtesy of precise steering and a supremely shift-able transmission. Thanks to Mazda’s rebirth of the affordable roadster, letting the sun shine in never felt so good. When you have something as tried and true as the roadster formula that makes up the Mazda MX-5, it has been worthwhile to tread lightly with updates. However, add a factory-built turbo to the mix, and things can only get better. And it does, the Mazdaspeed MX-5 sprints to 60 mph in under seven seconds and turbo-lag is nearly non-existent. All around, the Mazdaspeed treatment stiffens the ride and accentuates the stability that the Miata has built a reputation for. MX-5 plus turbo equals fun factor multiplied. It’s a formula for success that any car enthusiast can figure out once you get behind the wheel of this pocket-rocket. When the first MX-5 Miata hit dealer showrooms in 1989, it sold like hotcakes and early buyers endured waiting lists and over-sticker pricing for a chance to own the “Mazda-Experiment Project Number Five.” The cars official name “Miata” was coined by product planning head Rod Bymaster. It was based on the German translation of “reward” and it’s fitting since the Miata is certainly a rewarding drive. After 20 years of market success, Mazda put together the Super20 to show off at SEMA. The Super20 was shown in 2010 in medium gray and repainted a muted yellow for 2011. Taller tires on Enkei rims, coil-overs, and front and rear anti-roll bars give the Super20 an improved ride and smart stance. The real treat is under the hood, where 200 horsepower are ready to excite, compliments of a Cosworth supercharger, ECU tune, and Racing Beat header and exhaust. To register, users must log into Xbox Live on Xbox One and navigate to any one of the following channels: Games, Music, Movies, or Apps. From there, users should click on the Mazda MX-5 ad to reach the Mazda MX-5 ad landing experience. Once on this hub, users must register to enter the contest by following the prompts on the contest page.